The Elise is Lotus’ very attractive sports car. The Elise is quality built and handles extremely well. Seats are low to the floor and the focus is mainly on providing a good driving experience. The newer version of the Lotus Elise focuses on some of the extras such as trim, carpet and a good audio system. The drive experience is still the primary focus, but the extras add a little something more to an already great car. The car’s mechanics are much the same except for a few minor tweaks here and there. The car’s exterior design has also been enhanced and the car’s wheels have been changed. The car requires some care while accessing or egressing the cabin. It requires quite a climb but is made easier with the top down. Limited access will definitely limit some passengers from enjoying all that the Elise has to offer. The Elise is a fast lightweight sports car that can definitely hold its own on and off of the racetrack. The car handles remarkably well and delivers a terrific driving experience. The car can reach 0-60mph in five seconds. The Elise is an expensive purchase and fuel and running costs are likely to be high as well. Insurance will be high too and good coverage will be necessary if taking onto the track. The Elise is not big on space. Passengers have ample room to ride but that is about it. The car was not designed to be a cargo carrier or people carrier. It was designed for speed and delivering a good driving experience. The car’s controls and dials are functional and sturdy. They appear to be of a good quality and feel. The cabin looks the part of a sports car and delivers an excellent and sporty atmosphere. The Elise delivers a decent amount of comfort. This isn’t a luxury car by any means, but the seats are supportive and comfortable for the most part. Accessibility is one area where the Elise scores low, very low. Passengers must climb down into the seats and then limited cabin space means twisting and turning to fit into the seats. Once in though, the seats are comfortable. Egressing requires the same amount of effort only backwards. Parking can be difficult mostly due to the low seating position. The low drive position limits visibility and can make parking a little difficult. It is also difficult to judge the car’s extremities and care should be taken when parking. The Elise provides an excellent, fast, fun and exciting driving experience. The car looks great and handles well. The car is fast enough to take to the tracks and stylish and refined enough to cruise around town. This isn’t a family car in any sense of the word. Children will not fit well in the car’s seats. Limited cabin and boot space make it unsuitable to perform any family duties. It could be used as a third car for a family just to have around for fun. The Elise is definitely not a good first car. It is too expensive and would be impossible for a new driver to ensure. There is too much power on hand for a novice driver and parking can be tricky. The Lotus Elise has a great image. It is quickly recognized by most as the ultimate driver’s car. The car is fast and beautiful. The fact that the car has endured for so long is testament to Lotus’ ability to keep it fresh and modern. The car’s standard security features include power door locks, keyless entry, wheel locks, and an alarm and engine immobilizer. The Elise is a very desirable car and requires a comprehensive security system. Lotus has not overlooked safety. The car comes equipped with driver and passenger airbags, three-point seat belts, pre-tensioners and side guard door beams as standard. The car sits fairly low to the ground and may be difficult for other motorist to see. The car’s standard audio unit includes a Blaupunkt® AM/FM radio. The unit comes with four speakers and a CD player. The system produces good sound quality even with top-down motoring. The car boasts dual reclining sport bucket seats. The seats are cloth with leather trim. The car comes with a removable soft top, an alloy gear shift, steering wheel and handbrake. The Elise has come a long way since its origin in terms of creature comforts, but it is still evident that the drive experience is the car’s number one goal. 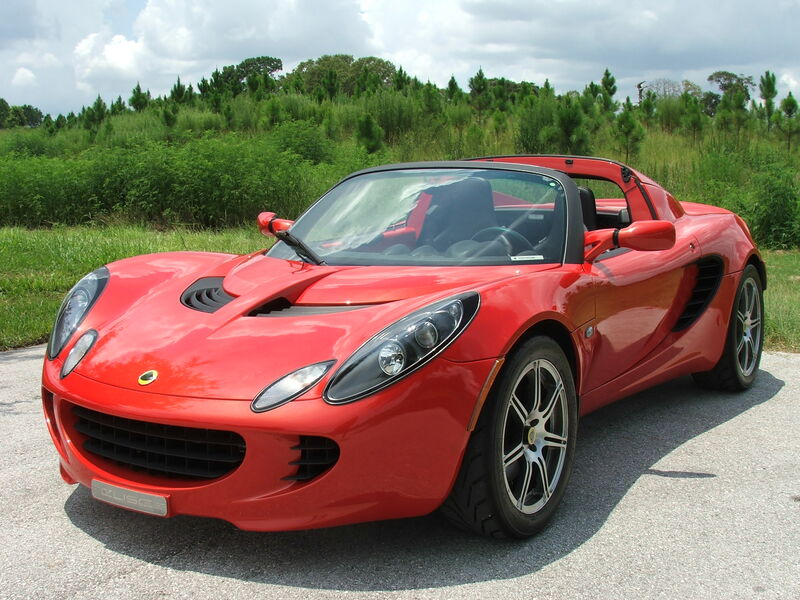 The Lotus Elise is a two-door, two-passenger convertible sports car. The car delivers everything it was designed for. Driving enthusiasts won’t be disappointed, but for anyone who is thinking about buying an Elise for practical purposes this is not the car for you. Its limited capabilities make it an impractical car for load lugging or people carrying. Get more for your buck when you lease!